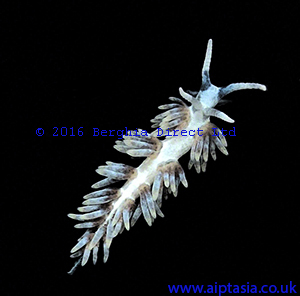 I'm a serious UK breeder of the Berghia Nudibranch and if you're viewing this website you probably know exactly what these amazing little guys can do and how they can effectively eliminate your aiptasia problem. 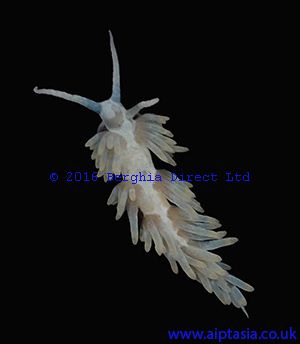 I've been breeding Berghia Nudibranchs for several years and have a mature and well organised program of husbandry and state of the art breeding systems in place to produce the happiest and healthiest little nudibranchs which eat aiptasia like you wouldn't believe. 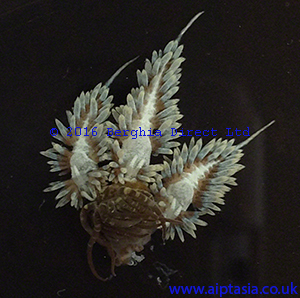 I co-culture the aiptasia pest anemone in vast quantities in thousands of litres of salt water tanks and feed the aiptasia only the highest quality foods to ensure consistently healthy and high quality nudibranchs which I stand behind 100%. My clients include such prestigious establishments as National Museums Liverpool, the Blue Planet Aquarium in Cheshire, the SeaQuarium in Western-Super-Mare, the Oceanarium in Bournemouth, Chessington World of Adventures, the University of Essex, as well as countless shops, hotels, leisure facilities and hobbyists from beginners to experts. I've developed my own state of the art systems with both battery and generator backup power sources to create consistent and stable environments in which to breed the healthiest Berghia possible and each of my small, pampered breeding groups live in dedicated environments with hundreds of litres of water and filtration and only the best equipment, controllers and monitoring systems available to ensure their happiness and wellbeing. I adore these little guys and I've been supplying directly to hobbyists, the trade and to public aquariums for a couple of years as a correctly registered UK company and for much longer as a hobby breeder. Please do not confuse me or my company (Berghia Direct Ltd) with any other Berghia breeder you may have come across online. I do not take advance orders, take money up front, have a waiting list or advertise animals that I do not have. All the images on this website were taken by myself and are not "stock photos" from elsewhere. In my experience 3 Berghia per 100 litres is a good number to work on based on a reasonable amount of aiptasia, but the more you have the quicker they'll eat the aiptasia. These are large Berghia and have the appetite to match their size. Happy Berghia are laying eggs constantly and its actually the babies that become easily visible many weeks after hatching that tackle the bulk of the aiptasia problem rather than the actual adults themselves. If you only get two, if something happens to one of them you then have no chance of any eggs and you're relying on that lone Berghia to clear your aiptasia problem. If something then happens to that one Berghia you're back to square one. The usual size for Berghia to be offered for sale is around 5mm or so but I always sell at a much larger size and always at sexual maturity when they're laying huge egg strings so you get amazing value for money. More often than not, Berghia seen for sale on other sites are offspring of Berghia that I have bred and supplied in one way or another over the years. If you've had Berghia from another supplier in the past you were probably disappointed with the size you received, but mine are simply the largest, healthiest specimens you will find anywhere. In the USA they'd be considered "high flow/SPS Berghia" and would command a premium, but this is a standard selling size for me..
My aiptasia farm can consume a kilo of food per day and the Berghia are fed well over 1,000 aiptasia per week and are often 2-4 times the size of other Berghia being offered for sale by others at the same age. 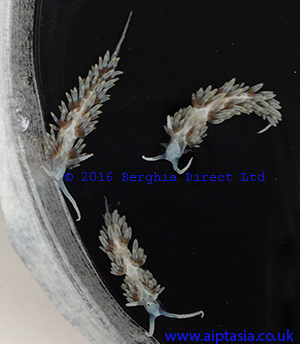 Breeders selling tiny Berghia do not have the aiptasia required to grow them any larger and need to sell them quickly for whatever they can get for them almost as soon as they're visible. I have thousands of litres of dedicated aiptasia tanks and have thick carpets of aiptasia so I don't have that problem. My Berghia are extremely well fed and grow extremely quickly due the the abundance of food available to them. Don't be tricked into thinking tiny Berghia are better or that they live longer as is often falsely claimed - its just a tactic to try and make hobbyists think its acceptable for them to be sold so small to reduce the need for the breeder to have the massive amounts of aiptasia required to meet the feeding demands of a healthy breeding colony of large Berghia. As you can see from my photos I only offer mature, well developed specimens of the highest quality rather than tiny underdeveloped babies which hobbyists are often tricked into believing are acceptable. Berghia are hermaphrodites meaning they possess the characteristics of both sexes and they mate upon most encounters with each other. A trio of Berghia can yield a lot of babies to eliminate your aiptasia. Berghia don't really have any natural predators but it has been known for a curious wrasse to have a nip and then spit them out. When a Berghia eats aiptasia, it changes colour and the aiptasia's stinging cells are thought to remain in the Berghia's body for a while. If a fish that eats aiptasia such as a copperband or a file fish nipped one while it tasted like the aiptasia it's just eaten, it's possible the fish might eat it. I have never known it to happen to either myself or anybody I've sold to, but in theory it is possible. If a Berghia got too close to a bristleworm nest on the floor then the bristleworm's reaction might be to attack it to protect its nest, but they are not natural predators. Amphipods are scavengers and may eat Berghia eggs if they came across them, but there's little chance of one taking on an actual Berghia. It's unusual to see Berghia in a tank after they've been introduced unless they are searching for food. They're mainly nocturnal and usually only come out several hours after lights out and can be incredibly hard to see even in a small tank. They take weeks/months to become established to the point that you're suddenly seeing rapid aiptasia reductions. They live in the tiny little holes and crevices in rock and they'll be eating the aiptasia that is underneath/inside structures before venturing out into the wider tank where the larger aiptasia can be seen from the outside. A small piece of rock the size of your fist could probably hide dozens of Berghia. They have no bones so can squeeze into the tiniest holes. When trying to spot them, it's the shaggy bits on their backs moving in the current that you should try and look for. Berghia are hardy and do well in all salt water environments, even in less than ideal conditions. If you have a high flow SPS tank these little guys can easily cope and the high flow will not be a problem for them. I've seen them accidentally sucked through MP40's before with no harm done but once they're in a tank their foot is extremely strong and it would be rare for one to let go and start free floating. 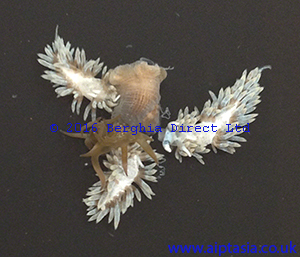 Berghia are 100% reef safe and all they eat is aiptasia which is why they're so effective at eliminating an aiptasia infestation. Berghia will starve and die once all the aiptasia has gone, so it's a good idea to then pass them onto a fellow hobbyist. They do not eat or nip at anything else other than aiptasia. My tried and tested packaging methods have safely delivered healthy Berghia during temperatures as low as -15 and as high as 34 in the last heatwave and I regularly subject my Berghia and packaging to routine tests in both hot and cold environments to take into consideration all variables and weather extremes including delayed delivery, to ensure the best possible environment for the healthy delivery of my Berghia. I stand behind my Berghia and my packaging 100% and guarantee a safe arrival and will replace immediately at my expense should anything go wrong before they reach you. There's no extra P&P charge for multiple trio's of Berghia purchased. Please check the top/right of this page for availability. When the "buy" button is there I have them in stock and ready to go! I include a full A4 care sheet including acclimatising instructions and general tips on their care and when you buy Berghia from me I provide ongoing advice and support and I'm always just an email away should you have any questions. If you have any questions or concerns after reading this information, please do not hesitate to contact me at justin@aiptasia.co.uk and I will respond as quickly as I can. 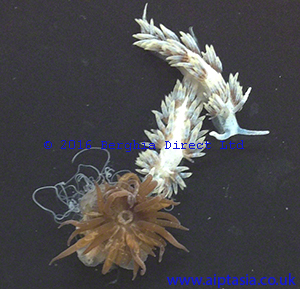 Please also check my feedback on ebay for reassurance of the quality of my Nudibranchs and safe packaging. Healthy Nudibranchs, value for money and exceeding customer expectations are my #1 priorities. Included with all orders is a free care sheet and correctly sized pipette for safely transferring the Berghia from their transportation containers into their new home in your aquarium. I'm a professional and reputable breeder and enquiries from reputable trade outlets and public aquariums are welcome - feel free to contact me by emailing justin@aiptasia.co.uk for trade pricing. Please do not confuse myself nor my company, Berghia Direct Ltd, with any other breeders you may have encountered or heard about. Order by 12 noon Monday to Thursday for next day delivery! All text and images in are copyright © 2018 Berghia Direct Ltd and may not be reproduced without prior written permission. Suppliers to hobbyists, the trade and to public aquaria.